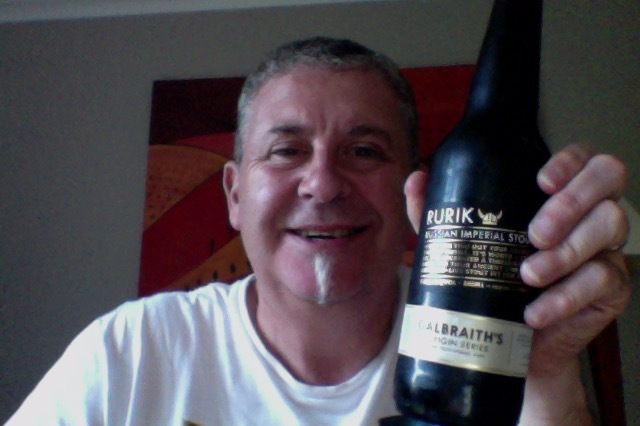 A tale of two stouts, this one is the Galbraith’s Rurik which is a Russian Imperial Stout, following on from the Fullers Black Cab stout. And 750 beers, seven hundred and fifty. mostly all different, and from all over the place. Doing my bit for the craft beer brewers is what. …..stout fit for a king…. When you find out your ancestor was the first Tsar of Russia, it’s worth a celebratory drink. So, I’ve recreated a timeless classic using Fuggle hops and their ancient lineage. A deep, black espresso-like stout fit for a king. Toasted rich milky aroma on opening. Inept pouring means I ended up with a dark coal beer with a head of 1/3 of the glass, and it’s full, firm, noisy and shows no sign of fading away. But what a look! Slightly milky aroma but I think I might have dealt to it with that pour, I’ll get back to the aroma later. This is a beer that has a fairly big finish, and then a finish that is really at the dry end, Lovely sweet start and a milky middle where the bitterness gets a hold and then short sharp finish, and that dry finish on the tongue. This seems to have much more of that milky middle that is quite nice, and the Fuggles hops give it a faintly familiar bitterness that is just there to remind you of things. This is very nice drinking, and it is what it says it is, you can pick the hops, you can pick the coffee, and all you can do is sup and enjoy it. Am I enjoying it? It is a nice Stout because it really isn’t a lot of frills. Would I have another? I might indeed should chase allow. Would I share with a friend on a porch and set the world to rights? There are other good stouts of merit and better taste profile around, and that would be the thing that stops me, However if in some way t was s Stout Night this would be in the mix as a fine example. Music for this: ” I am Oak” with an album called ” Our Blood” on Spotify. I Am Oak is often described as folk, indie and acoustic. 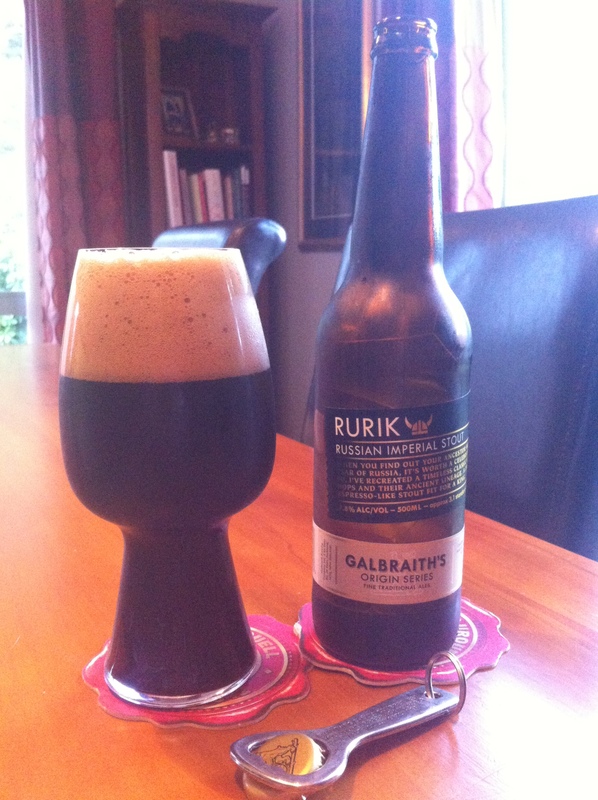 This entry was posted on March 10, 2016 by Philip Walter in Beer, Beer of New Zealand, Beer Review, Craft Beer, Critic, Galbraith's, Imperial Stout and tagged Alcohol by volume, Beer, craft beer, galbraith brewing company, Galbraith’s Rurik Russian Imperial Stout, Rurik Russian Imperial Stout.